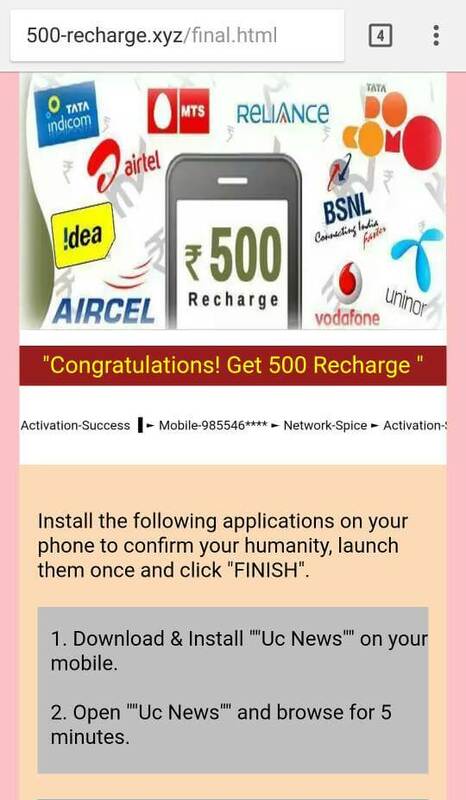 This 500-Recharge.xyz offer is fake. It makes you install an App which can be a Malware. Please refer to the verification section of this article for more details. Hello friends…..free me 500 ka balance mil rha hain, tum b kar lo….. Mere number p to ho gya 500 ka…. only 2mint me.! Note:-… Ek.sim pr Ek hi bar recharge milega. Like all the other similar scams which we have reported this one also makes you install sponsored apps. These apps can be Malwares which can harm your phone and use your contacts and other information from your phone. Below is a picture of the page. Thank You for visiting Check4Spam. Kindly leave a comment at this article if you like our service.